Dothan Agent Resources | Articles | Wiregrass Area Subdivision Restrictions, Covenants, and Plots. This Week in Congress: Both the House and Senate are in session with a busy agenda. Tax reform, healthcare reform, wildfire management, IOT Cybersecurity, and the review of the SBA hurricane response. Links to watch the hearings live will posted on the NAR Government Affairs Facebook and Twitter accounts the day of each hearing. Here are 14 top trending real estate apps that we believe will support your core business activities. How should organized real estate respond when tech giants like Amazon and Facebook pour billions of dollars into creating real estate platforms? 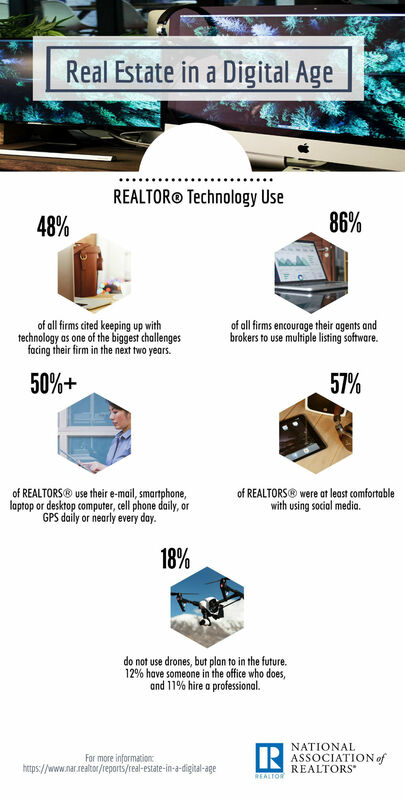 NAR Leadership wants to ensure REALTORS® stay well ahead of where technology is going. The latest Voice for Real Estate video looks at that and also NAR's Call for Action on flood insurance, the growth of virtual brokers, the latest scam to hit real estate, and how REALTORS® can be heroes to homebuyers who are looking for green home features. Learn about the possible legal risks when you use social media to communicate about your real estate business. WASHINGTON (July 12, 2017) – REach®, the growth technology accelerator operated by the National Association of Realtors®’ strategic investment arm, Second Century Ventures, was recently named among the top 30 accelerators in the U.S. by the Seed Accelerator Rankings Project, or SARP. Subscribe to the Center for REALTOR® Development Podcast by July 15 and Get $50 off your next CRD purchase. NAR Associate Counsel Jessica Edgerton shares risk management tips for buyers purchasing a home featuring devices connected to the internet, such as the heating system or security cameras. In a major victory for real estate, Data Distribution Technologies, LLC—a so-called patent troll that has been demanding patent licensing fees from real estate companies—has agreed to a settlement with the National Association of REALTORS® that will prevent it from suing, or threatening to sue, real estate practitioners, brokerages, MLSs and other companies in the real estate industry that offer email alerts to consumers about new or updated listings. Brokers will need to understand Bitcoin and blockchain technology in order to answer questions from both clients and agents. Here’s a primer. Changing and improving technology influences nearly every aspect of our lives, so it makes sense that it also affects the way homeowners and their agents market and sell homes. So what are the tools consumers and their agents should be using when trying to sell their home? ORLANDO, Fla. (November 6, 2016) – The business of real estate has become increasingly digital, and agents and consumers rely on websites to share and find real estate information, market homes and conduct property searches. In fact, according to new data from the National Association of Realtors®, 95 percent of all recent buyers used the internet at some point during the home search process. CHICAGO (November 16, 2016) –The National Association of Realtors®’ venture capital fund Second Century Ventures has become a strategic investor in Trust Stamp, an identity authentication company that leverages artificial intelligence and blockchain technologies. Trust Stamp, a startup founded in 2015 by Gareth Genner and Andrew Gowasack, is one of eight companies that entered SCV’s vertical tech accelerator program, REach®, earlier this year. The National Association of REALTORS®' venture capital investment arm is lending financial support for an identity authentication startup that leverages artificial intelligence. WASHINGTON (November 30, 2016) — As smart homes become more popular among consumers, buyers and sellers are showing greater interest in those homes and smart-home technologies and Realtors® in a certification to acknowledge their experience and expertise in those features. In this survey, NAR asked REALTORS® about smart homes and smart devices, which features tech-savvy clients are looking for, which brands they’re familiar with, and more. 37% of REALTORS® said clients find locks on smart home devices very important, followed by lights at 29%, and thermostats at 26%. 52% of REALTOR® clients were not familiar with what’s available for Smart Home Technology. CHICAGO (December 1, 2016) – Second Century Ventures, the National Association of Realtors®’ strategic investment arm, is accepting applications for its 2017 REach® accelerator class now through January 31, 2017 at www.narreach.com. Starting January 17, you’ll see a new way to log in to nar.realtor. This new log in experience is the beginning of a single sign-on process that will eventually be used for all NAR-owned web properties, including the new NAR Member Center, your personalized window into your NAR membership. NAR single sign-on employs the most secure method of authentication available today. It’s part of our commitment to provide world-class service to REALTORS®. The National Association of REALTORS®, through an investment by its venture capital fund Second Century Ventures, now provides members with an identity authentication service. Trust Stamp uses patented software to analyze hundreds of public records and social data to quickly provide reliable identification verification for real estate professionals meeting new clients or unknown individuals. The information in this infographic comes from the 2017 Real Estate in a Digital Age report. The information from this quiz was taken from the Smart Homes & REALTORS® report. The data in this visual presentation comes from the 2017 Real Estate in a Digital Age report. Click the image above to scroll through the presentation. See and share an infographic containing information from the report. WASHINGTON (April 17, 2017) – With an offer of $100,000 from investor Barbara Corcoran, 2015 REach real estate technology accelerator participant and personal safety device company, Guard Llama, is officially a part of “Shark Tank” television history. CHICAGO (April 20, 2017) – The National Association of Realtors®’ strategic investment arm, Second Century Ventures, unveiled seven organizations chosen for the 2017 class of REach®, a growth technology accelerator program helping launch companies into the real estate, financial services, banking, home services and insurance industries. The program is focused on providing early-to mid-stage companies with access to NAR’s industry expertise, influence and key relationships as companies are launched into the trillion dollar real estate space. The seven companies in 2017 range from seed stage to well-capitalized startups backed by world-renowned investors; in aggregate, the class has raised over $50M in previous financings and total valuation exceeds $350M. The REach® program aims to move these organizations rapidly forward beyond their initial successes through education, mentorship, and market exposure. WARNING: If you receive an email with the subject “Important Updates to Database!” it is not from NAR. The email uses the phrase "To that end, if you could please look through attached PDF; which contains a list of all Members along with their contact information and make sure yours is correctly represented." Do not open any attachments or click any of the links, which may ask for passwords. Please delete this email if you see it. There is a steady stream of tech companies entering the commercial real estate market, bringing both innovative ideas and a hunger to disrupt this industry. Here are my thoughts on why this should be welcomed. Listing data that enters Upstream may now have the option to be downstream of the MLS. That's the gist of an announcement made Tuesday at the REALTORS® Legislative Meetings & Trade Expo in Washington, D.C., by UpstreamRE, a data management company formed by a group of brokers and franchises to give brokerages greater control over how their listing data is used and shared online. WASHINGTON (May 17, 2017) — Two more innovative technology companies have been selected to join REach®, a growth technology accelerator program from the National Association of Realtors®' strategic investment arm, Second Century Ventures. Adwerx, a digital advertising provider, and immoviewer, a 3-D virtual tour technology company, will join the seven other companies announced last month as part of the fifth REach class. Toss the notepad, look up from your phone and listen in. These on-the-go apps will leave you wondering how you ever lived the mobile life without them. Situation: Have you ever needed to get in touch with a client, only have 3 minutes before your next appointment, and wished you could just leave them a message? Solution: Well this is where Slydial comes into play. Simply dial 267-slydial, then after the prompt, dial your client’s phone number, and you’ll be directly sent to their voicemail. One, and, done! Now, you are able to make it to your appointment and your client receives the information they need in a timely manner. Situation: And what about those tempting voicemails you would love to listen to, but the client you’re with might find it rude if you step away? Solution: YouMail. A free app which offers a number of voicemail solutions. One of which transcribes your voicemails and texts them to your phone. You can then take a quick glance without taking significant attention away from the task at hand. Situation: It can be tempting to try and work while driving, but it’s critical to keep your safety in mind. Solution: DriveSafe.ly is an app that will read your text messages and emails aloud as you drive. Just activate the app as you enter your car then toggle the app off as you exit. Situation: You can never be too cautious when meeting new people. Solution: And MyForce is your mobile bodyguard. If you ever feel uneasy about a location or situation you only need to arm the app to place it in ready mode. If you feel threatened, with a click of a button, you can alert MyForce of your location. They’ll instantly listen to the audio from your mobile device should you be in a situation where you can not speak with the operator. Because you’re pre-registered, emergency personnel are aware of your description, emergency contacts, and known medical issues. Situation: You’re most likely accessing your email from your mobile device, but there is so much more out of office convenience to use on your phone. Solutions: Track your mileage with Milog, a mobile app that keeps a record of your mileage for reimbursement or tax purposes. While you’re at it, store those records in shoeboxed.com. Shoeboxed allows you to scan receipts and business cards from your phone or computer, and documents them in a safe and secure online account. If that’s not enough, you can even stuff an envelope full of receipts and shoeboxed will scan, upload, and shred the originals for you all for less than ten dollars. Situation: We’ve all been there – you have a document that you need to submit but you’re nowhere near your office. Solution: With Turbo Scan, your phone becomes a scanner. You’ll be able to scan and email receipts, business cards and even larger items like documents and reports. Need something printed? EuroSmartz connects your mobile device to any wifi, bluetooth, or network printer. Now you can access your Google docs and print them from any location. You’ll truly have a mobile office after integrating these apps! Situation: Trying to convince a prospective client that you’d make a great listing Agent? Solution: Why not offer a free floor plan sketch? With Magic Plan, a free mobile app, anyone can create a floor plan drawing within minutes! Magic Plan measures a floor plan from the pictures you take then converts them into a PDF, HPG and DXF drawing. Situation: Once you’re the listing agent, you know how important great photos, and even more so a high-end presentation can be. But how do you achieve this on the go? Solution: Use Animoto to create photo stream videos set to music that can be used on listing pages and social sites. Have some time on your hands while the inspector is around? Your clients will love the video of their new house that Animoto helps you create. Make sure you use a picture of your Agency sign so their friends will know who sold them the home when they share the video. Organization Keeping your life well organized is one of the best ways to ensure success. With your busy lifestyle, maintaining your organization can be difficult. Use these apps to ensure you’re prepared for whatever happens this year. Circleback: Clean, complete, and merge your duplicate contacts so your address book is always up to date. Expensify: Allows you to virtually keep track of your receipts so managing your expenses is easy and efficient. Pocket: Pocket is an easy to use bookmark tool that helps you to save content and articles you find on the web to your “pocket,” making it easy to access for your blog or newsletters later. dotloop: Dotloop is the leading online transaction and productivity optimization platform in real estate. Productivity Productivity is a sink-or-swim game when it comes to real estate. Most of the time, it’s easier said than done. When our schedules become hectic, we often abandon our scheduled plans, which usually leads to making up for it later. These productivity apps can help you save time while still helping you accomplish everything on your to-do list and keep your life (relatively) stress free. Notability: Use this app to write notes, type up quick documents, sign and share contracts, and for general organization and workflow creation. SignEasy: If you’re always on the go, it can be nearly impossible to get back to your office every time you need to print and sign something. With SignEasy, you can “draw” your signature and start signing mobile documents on your phone without having to drop what you’re doing. SwiftKey: The Swiftkey app helps you type messages faster and more accurately with smarter, personalized word prediction. Scanner Pro: Scanner Pro is the best app for quickly scanning and saving a digital version of a paper document. Docusign Transaction Rooms: Docusign provides a complete secure way for real estate professionals to manage their transactions. Real Estate Millennials are a major focus of the real estate market. According to a recent survey, millennials now represent 32 percent of the U.S. home-buying market and 68 percent of first-time buyers. When you’re working with millennial homebuyers, keep in mind that they’re digital natives and are used to instant access to information. With these real estate apps, you’ll be able to keep in touch with this on-the-go generation while providing useful information when they need it. Homekeepr: This agent-branded app sends your past clients maintenance reminders for their home. It also allows you to set up a directory of preferred vendors for your client. Homes.com Mortgage Calculator: The ultimate, all-in-one calculator for all your real estate needs. Use this tool to help your clients understand their financial costs and options. Social Social media is one of the best ways to keep in touch with current clients and stay top of mind with potential ones. Here are some apps that can take your social game to the next level. This list does not include the basic apps such as Facebook, Twitter, etc..
Hyperlapse: The ultimate source for polished time-lapse videos. Use this to create 15-20 second property and neighborhood tours or use it to recap your open house! Facebook Ad Manager: This app is an incredible time saver for on-the-go agents. Facebook now allows agents to check their campaign’s progress, as well as edit and create ads right from their phones! Periscope: Allowing users to stream live videos from anywhere, Periscope is a great way to connect with potential clients across town or across the world. Stream open house tours, home sneak peeks, local events, or a Q&A session. While these apps can help you take your business to the next level, you’ll also want to make sure you position yourself in front of active homebuyers who are searching for properties in your local area. The goal and focus of DothanAR is to gather and digitize the covenants and restrictions of every neighborhood in the Wiregrass area. In doing this we strive to make the lives of Dothan area real estates agents and REALTORS, easier. We rely on local real estate agents in the Wiregrass area to upload the covenants and restrictions to us via site submission or email. This helps us keep our cost down so we can continue to provide this service free of charge to all Dothan Realtors. Auto-resizing images – Take a folder full of images and have them resize to a specific width while keeping the originals entact. Creating a series of custom file names – Set parameters for naming for files, like adding dates, names and other pieces of information. Extract text from a PDF. – Have an old document you saved to PDF but can’t find the original? Use this to get the text and quickly recreate that document. The programs created in Automator are really pretty simple to create. You can create services, that work in specific programs, workflows that can be used right from the desktop or dock. There are a number of pre-created tasks and apps you can take advantage of. Also, it allows for AppleScript, Apple’s quick scripting language for the Mac. There are a ton of features in Automator and one site in particular, Mac OS X Automation covers them really well. Only members of the NATIONAL ASSOCIATION OF REALTORS® and the Canadian Real Estate Association can call themselves REALTORS®. And only REALTORS® are allowed to use the new .REALTOR domain. In a complicated online world, it doesn’t get any easier to let prospects and clients know you adhere to our code of ethics and professionalism — and are a source they can trust. Did you know that thousands of new domains are being reviewed for approval and that they could change the way consumers search and use the Internet? That’s why NAR is securing the .REALTOR domain for its members. .REALTOR launch for members is 10.23.14! Starting 10.23.2014, members will be able to go to www.claim.REALTOR .REALTOR domains. The first 500,000 NAR and 10,000 CREA members will be able to claim their first domain FREE for one year. The Next Big Niche Market? Americans 55 years old and older are increasingly expected to begin trading residences as they near retirement, and that has many housing analysts and homebuilders predicting a surge in active-adult homes and communities that appeal to seniors. Could some baby boomers face housing challenges in retirement? Homebuilders PulteGroup, Lennar, and Toll Brothers are reporting higher sales in this segment. Builders also are trying to lure this age group with multigenerational amenities, such as a separate private entrance, bedroom, bathroom, and eat-in kitchen attached to a traditional home. “Consistent with the overall housing market, we have seen sustained improvement in demand for our active-adult homes for the past two-plus years,” says PulteGroup spokesman James Zeumer. PulteGroup builds the Del Webb brand of active-adult communities. Its active-adult sales rose from about 4,100 homes in 2011 to 5,300 in 2013. Also, sign-ups for new orders in the second quarter were up 11 percent over a year earlier, Zeumer says. The National Association of Home Builders’ 55+ Housing Market Index also reflects greater optimism in the 55-plus housing market. This year, the index reached its highest second-quarter reading since it began in 2008, and it posted its 11th consecutive quarter of year-over-year gains. Total existing-home sales rose 2.4 percent in July, reaching the highest pace of the year but still remaining 4.3 percent below last July, which marked the peak for 2013.